Posted on February 27, 2013 by Susan H.
I have been perusing through the piles of magazines that have been collecting in various corners of my house…tearing out recipes that I hope to adapt. One such recipe that caught my eye was in the July/August 2012 issue of Eating Well Magazine. Bev’s Chocolate Chip Cookie recipe was the winner of Best Cookies…after reading over the recipe…I just had to adapt them. Click here for the original recipe. Yum is all I can say about these crunchy little gems! Their taste reminds me of a chocolate covered digestive…one of my favourite store-bought cookies my mom would purchase for special occasions. Matthew was very taken with them…he polished off three of them in one sitting. I substituted 1/4 cup of Earth Balance Vegan Buttery Sticks (for a soy free version use Earth Balance Soy Free Natural Buttery Spread) for the butter. I substituted 1/2 tsp of baking soda and 2 tbsp of water for the egg. Just increase the baking soda in the original recipe to 1 tsp and add the water when the egg is added in the original recipe. P.S. 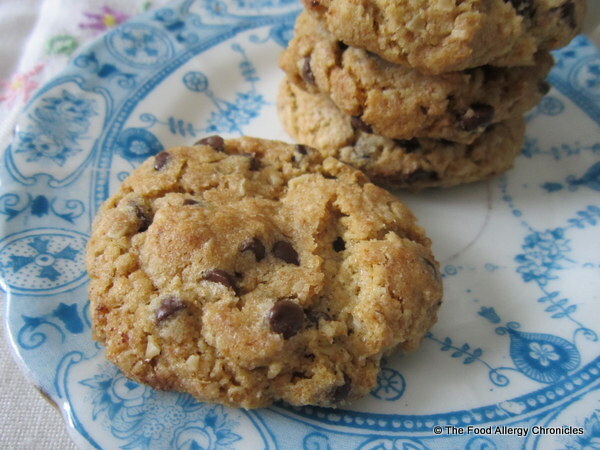 I am thinking… Dairy, Egg, Soy and Peanut/Tree Nut Free Whole-Wheat Oatmeal Chocolate Chip Cookies will be the perfect cookies to send to my Secret Sister. Lovely with a cup of tea to warm up after a brisk walk with her dog. I have signed up for Carla @ My 1/2 Dozen Daily’s Spring Secret Sister Swap. I will be posting my package to my Secret Sister in the coming month…watch out for it! 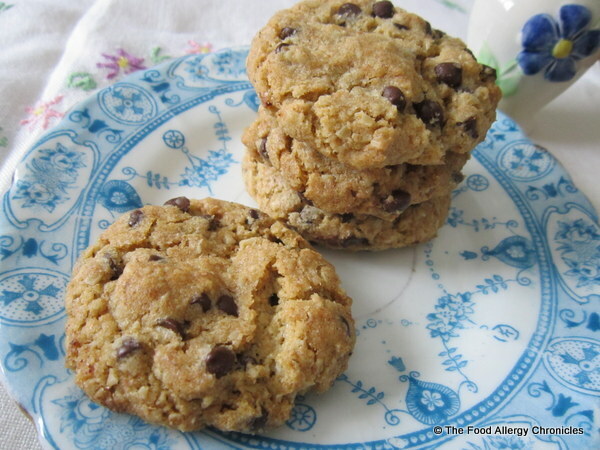 This entry was posted in allergies, baking, cookies, dairy free, egg free, multiple food allergies, oats, peanut/tree nut free, Secret Sister Swap, soy free and tagged 1/2 Dozen Daily's Secret Sister Swap, Carla @ My 1/2 Dozen Daily, Dairy Egg Soy and Peanut/Tree Nut Free Wholewheat Oatmeal Chocolate Chip Cookies, Earth Balance Soy Free Buttery Spread, Earth Balance Vegan Buttery Sticks, Eat Well Magazine, enjoy life chocolate chips by Susan H.. Bookmark the permalink. 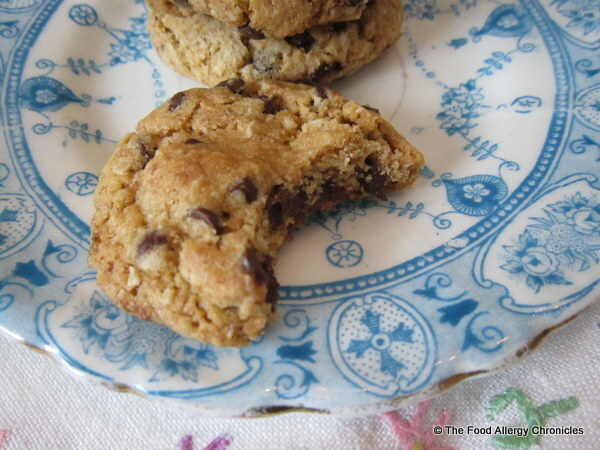 I use the chocolate chip recipe you gave me with the whole wheat flour and flax meal all the time, but I think I will try this one for a healthy chocolate chip cookie next….It looks great!